(Article was the headline news of the Oregonian today). Susana Holloway is a college-educated foodie who owns a business, shares a cute red bungalow in Northeast Portland with her husband, and loves children. She just doesn't want any. In Portland, the 37-year-old can feel at home. The city known for its young creatives should perhaps be known for its young and childless. Just 30 percent of households in Oregon have children, the lowest rate among all but seven states, according to U.S. Census data released today. 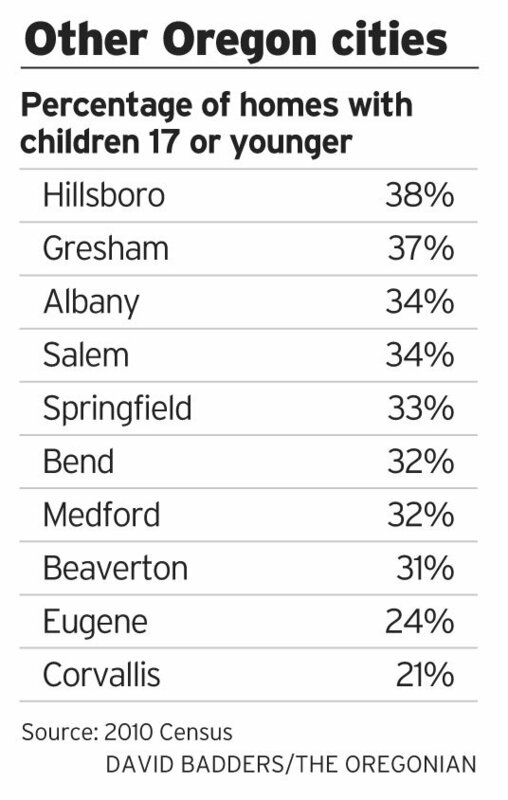 The picture is even starker in Portland, where only one in four homes includes a child 17 or younger. 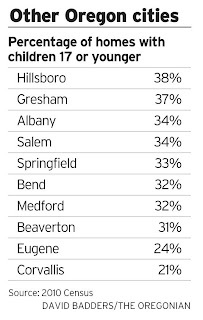 But while an aging population helps explain the dearth of households with children statewide, Portland is bulging with residents of prime child-rearing age. Fully 36 percent of Portlanders are ages 25 to 44, the highest share among Oregon communities of at least 10,000 residents. Yet the city's population of school-age children shrank over the decade even as the city grew. 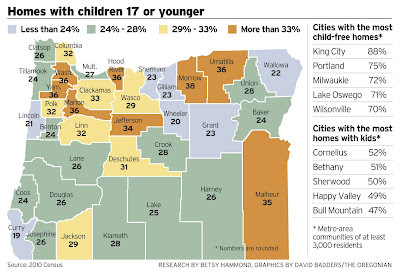 According to the 2010 Census, Portland is home to about 76,300 children ages 5 to 17, down by more than 2,800 from 2000. "Young people come here not to raise families but because the urban core is a place with close proximity to jobs, nightlife, good restaurants and having fun," said Charles Rynerson, a demographer at the Portland State University Population Research Center. "Many people who come here either haven't started a family here yet or they will somewhere else." The past decade, as many baby boomers aged from parents with children at home to empty-nesters, showed a sharp decline in the share of households with children -- nationally, in Oregon and in Portland. Oregon's rate of households with children dropped from 33 percent to 30 percent, paralleling a 3 percentage point drop nationwide to 33 percent. Clackamas County showed an even steeper decline, from 37 percent in 2000 to 33 percent in 2010. Clark County was part of the trend, too, with a drop from 40 percent to 36 percent. Americans gave birth to fewer babies in 2010 than in 1990, according to preliminary census tallies, despite tens of millions of immigrants entering the country. 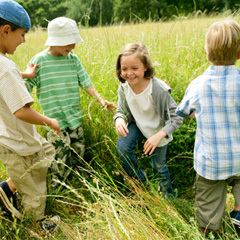 Twenty-three states saw a net loss in children since 2000. Oregon's under-17 population inched up during the decade, but the adult population grew much faster. Rynerson said a few factors link Oregon with the other states -- Maine, North Dakota, Montana, West Virginia, Florida, Pennsylvania and Vermont -- with the lowest rate of households with children. They all have a larger than average population of baby boomers. And except for Florida, they are very white states. White women have the lowest fertility rates. Yet according to the most recent national census study of women who reached their early 40s without having children, education is a greater influence than race or ethnicity on whether a woman becomes a mother. While Portland's population is young, it maintains a thriving creative class that is highly educated and tends to put off or eschew child-rearing. "This is a city of young foodies, designers and artists, and they don't have the energy or the time to want to start a family," said Holloway, who decided not to have children because of overpopulation and who runs a cooking school called Portland's Culinary Workshop. "It's such a creative city that people feel like they can make a go of it, and that's what they focus on. I joke that my business is my baby." Portland's Karen Foster published her book "No Way Baby! : Exploring, Understanding, and Defending the Decision NOT to Have Children" this year and said the census reflects a trend toward waiting for or forgoing children. "Many of these people simply haven't had children yet," said Foster, 43 and childless by choice. "People live here because they want to as opposed to going somewhere because of a job, so the city attracts people who are taking advantage of the lifestyle and may put off child-rearing." Progressive cities such as Portland apply less pressure to have children, particularly at a young age, she said. But she bristles at the "Portlandia" notion that the city is full of adults who refuse to grow up. "People accidentally get pregnant, but they don't accidentally not have children. That takes planning," she said. "Sometimes it's a very grown-up decision." PSU's Rynerson said having fewer households with children carries positive and negative effects. Fewer children relative to adults means fewer tax dollars spent on children's services. But it also means fewer people to pay into Social Security to care for an aging nation and to take jobs to fuel the economy as earlier generations retire. Locally, a dwindling youth population leads to school closures and other upheaval. But if Portland is unusual in its childlessness, one need look only a few miles away to find very different landscapes. More than 50 percent of households have children in Bethany, Cornelius and Sherwood. In Happy Valley, it's 49 percent. Jason Gardner, a 35-year-old real estate agent and father of three, moved to Sherwood 11 years ago and has watched it flourish as families planted roots. While Portland is heavy on rental housing -- 46 percent rent -- Sherwood draws families, and 75 percent of residents own their homes. "People typically don't move here to have babies, but I see people more times than not coming here to purchase when they already have young children," he said. "The biggest reason people move here is because it seems to attract people who want an environment where they can raise their kids peacefully and safely, and send them to good schools. Sherwood is a haven for those types of families."